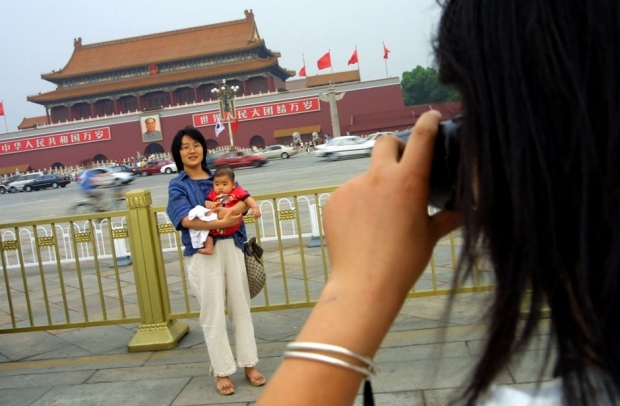 A mother poses for a photo with her baby in Beijing, July 7, 2003. This story was originally published by Tea Leaf Nation. Women giving birth out of wedlock in China have to contend with family pressure, social stigma, and financial hardship. Now, some of them may have to pay a hefty fine as well. Wuhan, a city of more than 10 million people in Central China, posted a draft regulation online containing measures that would introduce a fine on women giving birth “without being able to provide effective proof of paternity” as well as those who “knowingly have children with someone already married.” Commentators believe that the fine could run up to 82,000 RMB (about U.S.$13,000), or about four times the average annual income in Wuhan. The proposed fine is double the usual “social rearing fee” imposed on parents caught breaking China’s one-child policy. China’s family-planning authorities justify the fine with the theory that “extra” children take up valuable public resources, for which the “offending” parents need to compensate the government. The draft regulation drew heated discussions on China’s social media. One thread on Sina Weibo accumulated more than 5,300 comments and more than 7,000 retweets. Wuhan imposing fines on single mothers. U.S. and European countries usually give subsidies to single mothers and try to better the lives of this disadvantaged group. In our country, women are not protected. [The single mothers] are subjected to social stigma and must shoulder all the responsibilities by themselves, all for children that are born without a father’s love. Why impose a fine on them! After a child’s birth, their parents pay for all the costs like hospital stay, food, tuition from kindergarten all way to college. And they grow up to become taxpayers and keep the government and officials in their jobs. When did society ever rear them? How can you justify such a hefty social rearing fee? The prevalence of abortions in China means that the women who end up having children out of wedlock are either too uneducated or inexperienced to recognize what has happened to them, or paralyzed by fear of family reactions. Last week, a young woman’s baby had to be rescued from a sewage pipe. Some men who desire a son try to circumvent China’s one-child policy by having children with multiple women. The Wuhan authorities responded to the controversy by releasing a statement saying that the regulation has not been finalized. In recent years, many policy measures have been floated on China’s Internet first, seemingly to test public reaction before implementation. In the past, some measures have been abandoned after encountering a vociferous reaction online. It’s not clear what will happen in this case, but Wuhan’s powers that be may have already blinked.